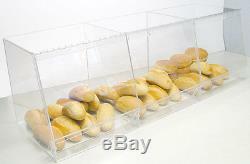 Bulk Bread Storage display case containers deli bakery sandwich Pastry Donut. 100% Made in the USA. 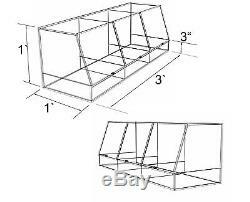 Bulk Bread Storage 3 Bin wide. 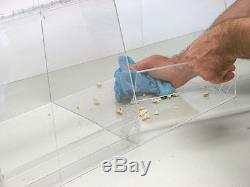 Our Bulk Bread Storage containers are made of Clear Acrylic. They feature a unique removable front in each bin to easily wipe out bread crumbs. Each bin has its own hinged access lid. It has a hinged access lid. Keep you bread, rolls or bagels fresh and displayed Professionally. The internal measurements for the bin is 1'-2 deep, 1' high and 1' wide. The total outside dimensions are 1'-1/2" wide, 1'-1" deep and 1'-1/2 high. Very Durable 3/16 thick acrylic. RCS Convenience Plastics uses all high impact-resistant top quality Acrylic materials. Our Condiment Displays, Cup and Lid Holders, Milk and Sandwich Coolers, Fork, Spoon and Knife Dispenser and Tea Racks all use 3/16 inch thick acrylic. Our Bread Displays and Sneeze Guards use 1/4 inch thick acrylic. The Napkin Dispensers and Straw and Stirrer Holders all use 1/8 inch Acrylic. We have tested the strength of all of these product and they are more than sufficient. Weather Resistance: Despite heat, cold, sunlight, and humidity our acrylic sheet maintains its original appearance and color. Chemical Resistance: Acrylic sheet resists many chemicals, including ammonia, dilute acids, and aliphatic hydrocarbons. A chemical resistance chart is available upon request. Safety: Shatter-resistant, earthquake safe, burglar-resistant. Light Weight: Even with its strength and durability, it is only half the weight of glass. &###xA0; &###xA0; &###xA0; &###xA0; &###xA0; &##xA0. &###xA0; &###xA0; &###xA0; &###xA0; &###xA0; &###xA0;&##xA0. Any product you return must be in the same condition you received it and in the original packaging. 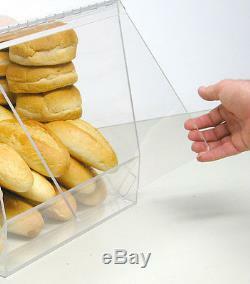 Bulk Bread Storage 3 Bin wide Part Number 3w_Bread Our Bulk Bread Storage containers are made of Clear Acrylic. The internal measurements for the bin is 1'-2 deep, 1' high and 1' wide. The total outside dimensions are 1'-1/2" wide, 1'-1" deep and 1'-1/2 high. RCS Convenience Plastics uses all high impact-resistant top quality Acrylic materials. The item "Bulk Bread Storage display case containers deli bakery sandwich Pastry Donut" is in sale since Tuesday, April 30, 2013. This item is in the category "Collectibles\Advertising\Food & Beverage\Bakery & Baking\Bread". The seller is "rcsplastics" and is located in Kunkletown, Pennsylvania.